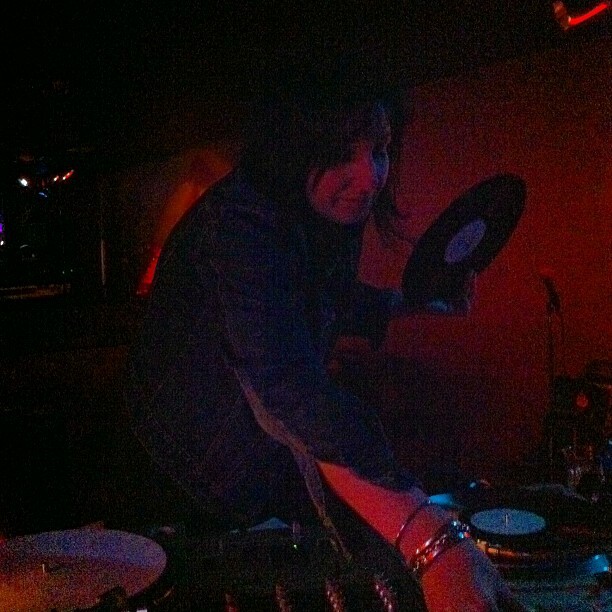 That’s me on the decks at Underground. The photo was taken with Instagram by my friend Tommy Pedrini. Tommy has a great band called Cats on Mars. I went to their debut gig back in November and was impressed. Check them out on Facebook. I’ve been getting a ridiculous amount of compliments lately on the denim jacket I’m wearing in the photo. It’s old, but not vintage. I bought it new at Old Navy about ten years ago. I love that Tommy was able to get my wrist full of bangles in the photo. Those are all from my boyfriend, because he’s awesome. But onto the set list. Before Underground, I was part of the Nerdywood panel for Dot Con Fest, an all Internet, live stream-based fan convention. We talked about Hollywood and geek culture. I got to mention the non-Hollywood phenomenon that is Homestuck, which was the subject of a post I wrote for L.A. Weekly last month. (Charleett, are you reading this? I still blame you for this obsession.) It was fun. Thank you to Tara Platt and Yuri Lowenthal for the lovely time.